Colors are very nice, quality seems pretty good. 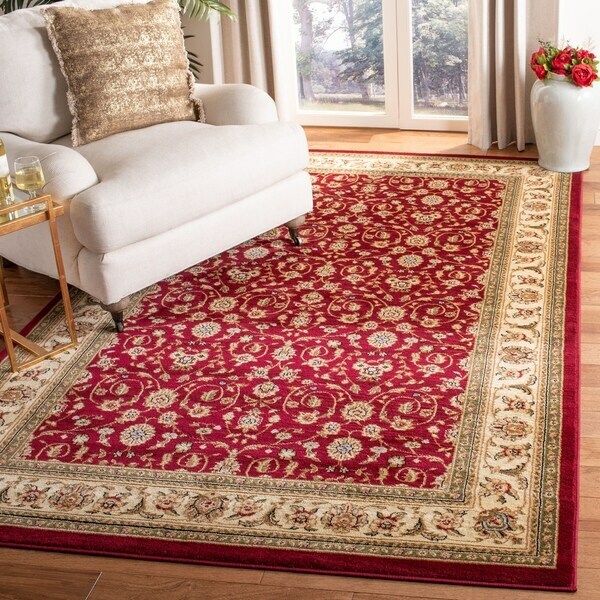 Good looking rug and pretty soft for the price but is definitely darker red than the picture and no matter what I try I can not get the humps and bends that occur from the rug being rolled to lay flat which make it look unattractive and cheap. I have purchased other rugs from the same manufacturer and have not encountered similiar issues. Great value for the price paid. Color is a little more on a brighter red side rather than burgundy; splashes of blue also adds additional vibrancy which worked out great for my daughter's room. Since it is used in a child's room, I am happy about non shedding part. Strong smell of glue was gone withing an hour. I received it about three weeks ago and it has been growing on me even more since it first arrived. This is my first time buying a rug online and I must say that I will not do it again. Very happy with my experience with Overstock, the rug was delivered quickly but the rug itself is not of high quality. The color is vibrant but my feet feel sticky after a few minutes on the rug. I'm thinking of returning it. I am so pleased to have this rug in my livingroom. I wasn't sure about the red but it is a very warm red tone and the pile is very tight and thick. The size is approximately 8x10 so it is an extremely good value fo the money. I am very satisfied !!! These rugs are beautiful and lush, they fill soft and luxurious under your feet. They are beautifully designed and are quality product. I definitely recommend. I couldn't be more pleased with my purchase of this beautiful rug. Very good quality for such a bargain price. My husband couldn't believe the price when I told him. 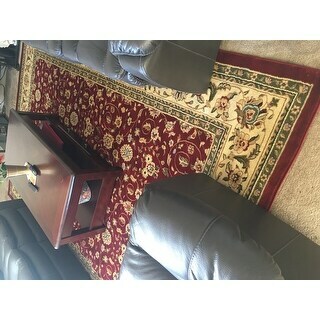 Would definitely recommend Overstock.com if you are in the market for a new area rug for your home! Happy shopping! This area rug looks beautiful in my dining room. I purchased this rug as with the matching smaller rug for my living room. The colors are beautiful and matches with all my furniture. The only thing that I don't like about it, is that it curls up on one corner. We needed a durable rug for our dining room and this fit the bill perfectly. The colors are vibrant and it's well made. Excellent rung... it is softer than expected and the colors are on the deep red side vs bright. It goes really well with the black couches in the living room. Love this rug! It was just what I expected. Soft and well made. we used this rug for good 4 years. Now I changed it from living room as per the other furniture. We still use it in the basement and it looks and works well after periodic rug cleaning. Love the rug! Colorful and adds to the beauty of the living room! Half of rug is one shade of burgundy and the other side is lighter.